Pets are wonderful. I have two cats, Luna and Nox (what’s Harry Potter?) Studies show that having a pet can lower your blood pressure, relieve stress and make you happier. And those are just bonuses! If you’re anything like me, your pets are more like family. They are companions and furry best friends who listen to you without interrupting and sometimes bite or scratch you. You form a special bond with them, unlike any other. You’ve given them your whole heart so it’s no wonder you want to keep them happy and healthy, just like they do for us. 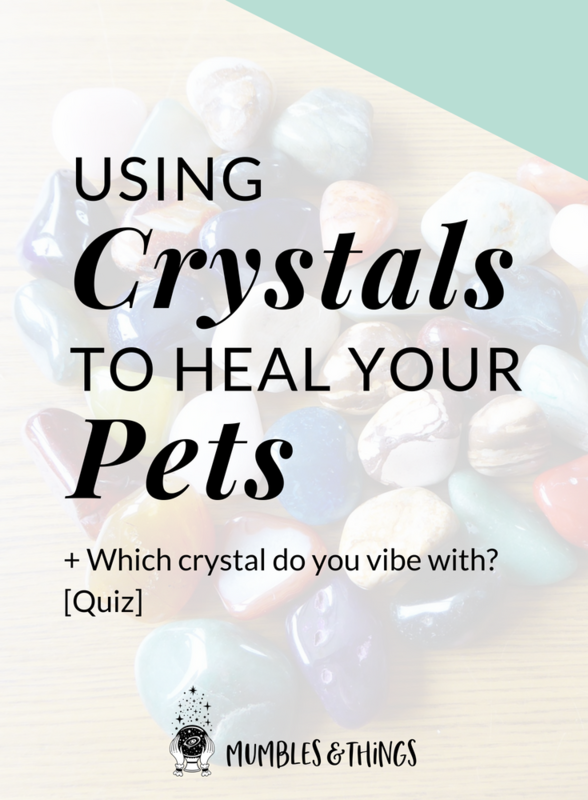 If you were wondering if your pets could benefit from crystal healing in the same way humans can, then I am excited to tell you that they can! Any crystals you have positioned around you home will influence those that encounter them, including pets. You can also place crystals that are specifically for your pets benefit in areas where they tend to spend a lot of time. When you have a special friend like a pet you start noticing when things are a little off with them. Be sure to always monitor your pet for signs of positive or negative health. The more you care for them the stronger your bond will become. Additionally, pay attention to changes before and after you begin using crystals with your pets. If they are not showing positive improvement remove the crystals. Of course, if your pet has a severe condition or a persistent issue, you should take them to see their veterinarian to rule out a more serious problem. Crystals can be used as a supplementary therapy to your vet’s treatment, but just as with people, should not be considered a substitute for a doctor’s recommendation. Place several crystals in front of your pet, distancing them from each other so you can tell which is selected. Let your pet smell and investigate. Watch carefully as they may use their mouth or try to eat it. Allow them plenty of time to explore the new item. Notice any indication of interest: softening eyes as if dazed or sleepy, touching or moving one crystal consistently, drooling or dripping from the nose, excitement and joy. Any crystals that your pet appears to be ignoring can be removed. Set aside up to three crystals that your pet seems interested in. You can also select crystals based on your pets behavior or tendencies. Below, you'll find a list of crystals you might want to keep around for use with pets. When your pet is not their normal, active self, seems to be lethargic, or has changed their eating habits, they could be depressed. Animals can be depressed just like people, especially when a human companion moves out of the house or another pet in the house dies. Place this stone in an area where the animal spends a lot of time, such as under the cushion in their favorite spot on the sofa. This stone is named for it's resemblance to the spots on a Dalmatian dog, so it's no wonder it can be useful when using crystals to heal your pets. This playful stone is beneficial for animals and tends to have a calming effect. The energy from this crystal balances and composes your pet's emotions. Also called Dalmatian Stone, this crystal can be helpful with anyone who experiences bad dreams (like children) and can promote peaceful sleeping. place a Dalmatian Jasper in an area your hyper pet often goes. This crystal can be useful for digestion issues and to alleviate abdominal pain. If your pet is having trouble in the yard or litter box, Leopard Skin Jasper could be the help they need. Make an elixir for your dog to drink. Place a cleansed crystal in a glass bowl filled with spring water and leave the bowl in the sunlight or moonlight for 12 hours. As an aside, if making an elixir from a fragile, water-soluble or toxic crystal (check crystal cautions for more information on this), use the indirect method and place the crystal inside a small glass jar before placing in the bowl of water. Whether you place the crystal directly in water or indirectly charge the water, the water will become infused with the energy of the crystal. Remove the crystal after 12 hours and pour the liquid into an airtight container. Store for up to a week. For human consumption, 50% brandy or vodka can be added as a preservative to store it for longer than a week; however, this is not recommended for animal use. For generalized animal healing, Dioptase is a great crystal to use. This green crystal is especially good for healing of the heart and mind. Often pets can have anxiety and feelings of abandonment when left alone for long periods of time, or when their owners are traveling. Leave this crystal with your pet to help alleviate any stress caused by this separation and to instill in them a feeling of being loved. Attach Dioptase to your dog’s collar if you work long hours. Do you feel like you just can’t figure out what your pet is trying to tell you? Mookaite will help facilitate better communication with your animals. This crystal will help you to be more in touch with your own animal instincts and ancestors as well. Wear this crystal or carry it in your pocket while spending time with your pets. As with many people, animals can also gain from the loving energy of Rose Quartz. It can give them the same sense of security and peace, as it does for you. This crystal is especially helpful for rescued pets and those who have experienced trauma or abuse prior to living with you. Place a large piece of this in the living room to benefit all household members – furry or not. Place a crystal under your pet’s bed or blanket taking care that you pet cannot eat them. You may want to sew them inside the fabric so they aren’t loose. Attach an unobtrusive crystal charm to their collar like a pendant humans wear. Use a small pouch attached to the collar as an alternative. Hold the crystal in one hand while petting your furry friend with the other. Placing crystals intentionally throughout your living environment is a wonderful way to experience all that crystal energy can offer you. All living things in your environment—including your pets and your houseplants—feel the effects of the energy and experience the benefits from them. Do you use crystals with your pets to heal them? Tell me below in the comments.